We are very excited to announce the arrival of our new Black Dymond Gripper Floorboards!! These boards will also work with our Black Dymond Hwy Brackets!!! These are the perfect addition to your F3 Spyder (all models) with factory Pegs. If you're looking to set your ride apart from all others these show quality boards will do the trick. These are made from a solid chunk of 6061 aircraft aluminum and precision cut on a CNC mill. The Gripper cut assures grip even in the rain like our Gripper pegs. The bottom of the boards are drilled and tapped in three locations for fully adjustable highway brackets. There is nothing like this on the market for your Can Am Spyder. The price point is very competitive for a part of this quality. The boards come powder coated in a textured black with the option for accent cuts to match our IPS products. These boards are "Lamonster Approved" and are designed and built by riders, not salesmen. If it's not good enough to go on our Spyder it's not good enough for yours either. 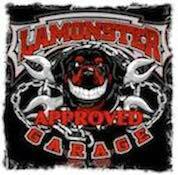 Lamonster products are fully tested before going to market and if we think we can make it better we will. We strive to hit it out of the park the first time and I think we did with these floorboards. This option is for those of you with OEM Pegs. These now come with factory OEM floorboard mounts. For questions about this product CLICK HERE. I was concerned about these until they arrived and were installed. Quality and fitment was as exacting as all of Lamonster's products and they look great on the trike. The riding position and angles are exactly what I needed. I had these installed at Lamonster Garage and had to ride in the rain afterwards. These made my ride so much more comfortable and even in the rain my feet felt secure on these floorboards. They made my F3 feel like I was riding my Limited. I highly recommend this upgrade. Great boards. Easy to install. The fit and finish are top notch. Another great Lamonster product.